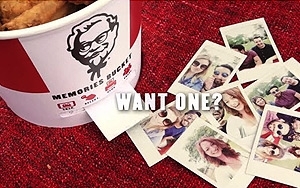 To celebrate its 60th anniversary in Canada, KFC has created a "Memories Bucket" that can print out photos from users' smartphones. The chicken chain has been teasing fans on its Canadian social channels by promoting a YouTube-hosted video (called "Bucket Science") that asks "Want One?" The video shows some young people having a blast snapping selfies and then watching them emerge as Polaroid-like photos from the KFC bucket. On its Canadian Facebook page, the brand describes the bucket as a limited edition, and asks fans to "stay tuned" because KFC will be "giving a few away." This isn't KFC's first foray into wacky branded devices. In May, the QSR offered limited-edition "Tray Typers" during some new restaurant openings in Germany. The food-tray keyboards were designed to let users type messages on their phones while eating without getting their phones greasy. The trays synched-up with smartphones via Bluetooth (which is also presumably the case with the new photo-printing buckets). Also, last September, to mark its 30th anniversary in Japan, KFC created a keyboard festooned with plastic fried chicken parts, and a plastic mouse and a USB memory stick shaped like fried chicken legs. Nor is KFC alone. In June, Pizza Hut unveiled limited-edition pizza boxes capable of doubling as movie projectors.